Notes: This power adapter offers fast, efficient charging at home, in the office or on the go. It works with any Apple device that requires charging. 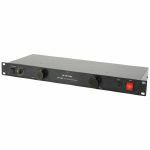 Notes: Protect your electronic equipment with this 19" rack mountable power conditioner featuring an RFI/EMI filter. The filter works by preventing noise from florescent lights, certain dimmers and similar sources of electronic pollution contaminating the AC line and leaking into sensitive audio, video or computer circuits. In addition; the front panel features two LED lamps with dimmer control for illuminating your rack. Notes: Protect your equipment and organise your power distribution with this 19" rack mounting unit. The front panel features a digital voltage meter and two LED lamps with dimmer control for illuminating your rack. 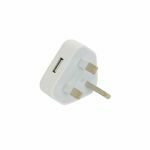 PLEASE NOTE: Requires 3 Pin Kettle Plug/UK Mains Connector (not supplied). Notes: This mains charger has 2 USB sockets, each capable of producing 2100mA output. Ideal for charging tablet computers, smartphones, cameras and other devices. 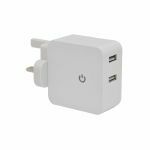 Notes: This power adapter provides power to MIDI Solutions products in instances when it is not available or where a large number of items are being chained in series. 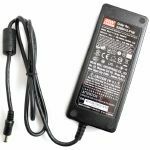 It has an optically isolated MIDI In, MIDI Thru, and power connection for a 9V (AC or DC) wall adapter. It's possible to power up to 20 MIDI Solutions products from the power adapter's single Thru output. It can also be used in a transmitter/receiver configuration to send MIDI over long distances. Notes: Macro Power S8 is a pedal power supply with eight output power supply jacks, equipped with vary functions input voltage switch, independent output power jacks, over-current protection and adjustable output. It was designed to meet users needs and offer convenient and pure experiences. One adjustable voltage output power jack, can choose output voltage from 9V/12V/15V/18V. The output current is 200mA. Three independent output power jacks, each lines output voltage is 9V, and the output current is 200mA. Four parallel output power jacks, each lines output voltage is 9V. And support the whole 400mA power needs that the four lines parallel into an independent output power jack. Notes: Mooer Stage Power Supply PDNT9V2AUK makes the ideal accessory for powering your favourite Mooer guitar effects pedals. Mooer Stage Power Supply PDNT9V2AUK can deliver up to 2 Amps at 9-volt (DC) 2 and features a pedal board style design. PDNT9V2AUK power supply when used with either the 'Power Cable Daisy Chain' PDC-5A (for 5 x pedals) or the PDC-8A (for 8 x pedals), can drive up to eight Mooer FX pedals. Notes: Designed especially for the use with effect pedals and pedalboards, the Purifier minimizes and removes noise induced by poor DC power adapter construction delivering clean DC power to your stompboxes. It provides standard 2.1 x 5.5 mm barrel jack connectors and automatically detects your DC power supply's polarity. The Purifier cleans any output voltage from 5 to 30 volts DC. Notes: The Samson PowerBrite PB10 Rackmount Power Conditioner and distribution unit. Protect your gear and organise your power distribution. The Samson PowerBrite PB10 is a 19" rackmount power conditioner that makes the perfect addition to any rack case. The PB10 is loaded with 9 IEC outlets (8 rear and 1 front panel). The PB10 features a 10-amp circuit breaker, surge protection, peak voltage clamping and RFI/EMI filtering to provide clean, uninterrupted power. The front panel houses 2 x LED lamps with dimmer control for rack illumination. The Powerbrite PB10 also has a gooseneck lamp included for lighting the rear of your rack case. Notes: The Samson POWERBRITE PB10 PRO is a 19 inch rackmount power conditioner that makes the perfect addition to any rack case. On its front panel it features dual digital voltage multi meters to display input and output voltage levels, and two led lamps with dimmer control for illuminating your rack. With surge protection and peak voltage clamping the PB 10 Pro is ideal for clean uninterrupted power. The Powerbrite PB 10 Pro also has a gooseneck lamp included for lighting the rear of your rack case. Notes: The Samson PS10 is a 1U rackmount power distribution unit/power conditioner built to the high standards expected from Samson. Its rugged construction makes it the perfect choice for pro audio, broadcast and PA applications where space, durability and reliability are crucial. The PS10 features 9 IEC outlets of which 8 are switched and presented on the rear panel and one unswitched on the front panel. Other features include incoming power spike and surge protection, RFI/EMI filtering and a re-settable 10 amp circuit breaker. Solid Samson build quality, great features and overall good value for money. The Samson PowerStrip PS10 Power Conditioner provides clean, reliable power and is an essential item in any rack system. A front-panel resettable 10-amp circuit breaker protects all connected gear. Notes: The Zeus Studio Bus is Tiptop Audio's next generation of the Zeus Eurorack power system and is the world's only high-power system that can guarantee low noise with minimal bleed-through between modules for a clear sounding synth. The power supply is the backbone of your modular system and will define how well it all works; this is not some simple circuit that flashes LEDs on but is a complex analog circuit, not something you want to chance with the various boutique power supplies. The Zeus SB takes the next step to simplify wiring up power into cases that scale from a simple 3U row to complete walls of modular synthesizers, all done without dealing with hot AC power lines. The Zeus system comprises of an external brick Cincon-TTA power supply, Zeus Access and a Zeus Studio Bus, providing everything needed for a DIY or a professional Eurorack case. The Zeus Studio Bus board is equipped with fourteen Eurorack standard power connectors and two AS power connectors. Connecting wires to and from the board is done using a spring action connector, no special tools are needed, all it takes is to push the lever down and insert the wire. The spring action connector provides multiple points of connection allowing for different types of power configurations, starting with simple daisy chains and up to professional multi-thread star wiring. At the heart of the Zeus SB is our new design of discrete linear power regulators, aimed at providing robust, Low noise studio-grade power to deal with today's growing challenge of a great selection of modules from many different manufacturers that must share the same power bus. And with an eye towards the future, the Zeus SB prepares you for the new wave of high-current digital modules and the upcoming Tiptop Audio Analog Polyphonic system. Notes: Vermona Replacement 12VAC/830mA AC power adapter (115V US 2-pin plug).